The GoPro Hero5 Black is the GoPro everyone has been waiting for. The company's previous offerings deliver great results, but the new device adds more than enough to warrant an upgrade. It reinforces GoPro's position as a best in class action camera. A new GoPro flagship action camera has finally arrived, two years after its predecessor. The Hero5 Black - which was announced alongside the Hero5 Session and the long-awaited Karma drone - and brings a host of new features with it. The new Hero launches into a market that has some serious competition though, much more than the company had 14 years ago when it first introduced the world to capturing their best action moments. The GoPro Hero5 brings with it an entirely new design and it's fabulous. The company ditched the shiny silver front found on the Hero4 and Hero3+ and traded it in for a matte black, rubbery finish that is not only easier to hold when out of its accompanying plastic housing, but waterproof up to 10-metres on its own too. The new Hero also has rounder, smoother edges than its predecessors and, although it is larger, it is much more refined. All the ports have been covered, accessed by pushing in the button and sliding the flaps down. The HDMI port and USB Type-C port are situated on the right-hand side of the Hero5 Black, while the removable battery and microSD card slot are underneath. The large protruding camera lens remains in the top right corner on the front of the rectangular device, as it has done on preceding devices, distinguishing the Hero5 Black as a GoPro. It protrudes slightly more so than the Hero4 Black as the waterproofing and protection are built-in, delivering the same finish around the lens without the additional casing as the Hero4 does with its bulky casing. he housing is how you mount the Hero5 Black and, as you would expect, it's the same system as other GoPro cameras, with plenty of options for any activity you can think of - from surfing to recording your child's first time riding their bike without stabilisers. A small, square monochrome display sits alongside the lens of the Hero5, though it is slightly smaller and more discreet than the one on the Hero4. There is also no black trimming, which is a blessing, while the red flashing recording light has been moved to the top left-hand corner of the Hero5, making it much less obvious. Branding is also more subtle, with a faint GoPro logo sitting under the lens, rather than Hero5 in big, black capitals, as per the Hero4. The On/Off/Mode button has also moved positions. On the Hero4, it sits at the front beneath the monochrome display, but on the Hero5 Black, it moves to the left-hand side, refining the front. The recording button is still easily accessible and unmissable the top of the device, but there is no longer a setting button on the Hero5, because all the settings can now be accessed from the two-inch touchscreen on the rear. Yes, that's right. 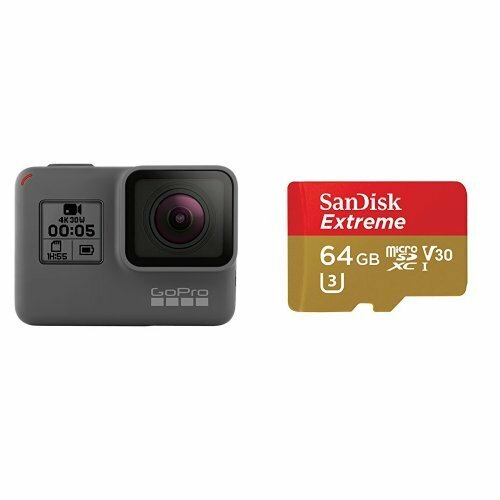 The GoPro Hero5 Black comes with a built-in touchscreen, meaning it is no longer necessary to use the Capture app to change settings, or buy a separate screen and attach it to the back, as was the case with the Hero4 and Hero3+. It also means settings are much more accessible, with streamlined menus for easy switching between field-of-view and resolution - rather than pressing numerous buttons and hoping you don't press the wrong one and end up back at the start menu. The built-in touchscreen is a godsend. It makes using the Hero5 Black and connecting it to your smartphone a lot simpler and more sophisticated. It also means it's possible to see what is being recorded and check you have the right angle or shot before you start capture, or without having to open the Capture app capture. This app is of course still useful if you want to mount the GoPro and control it remotely, for example, but it's no longer as necessary as it was with previous devices. With the plastic housing on the Hero5 Black, swiping down from the top of the touchscreen is a little fiddly and it takes a few goes to get used to - but once you're in navigating is a piece of cake, as is selecting the various options available. There is a little bit of lag in some places, but on the whole, the touchscreen is responsive, images are crisp and it is by far our favourite element about the Hero5 Black simply because it makes control so much easier. Another one of our favourite features about the GoPro Hero5 Black is voice control. There are currently 12 commands that are recognised in seven languages, including US English, UK English and AUS English. Make sure you select the right one or GoPro might not understand your accent. Voice commands include instructions such as "GoPro Start Recording", "GoPro Take a Photo", "GoPro Stop Recording" and "GoPro Turn Off". These are the ones we used the most frequently during our time with the Hero5 Black, and most of the time they worked flawlessly. Following a command, the Hero5 Black beeps to confirm it is doing what you've asked. If you don't hear the beep, it has ignored you - or just not understood. For voice commands to work properly you have to make sure you say the exact phrasing, otherwise no amount of raising your voice or getting shirty with it will get the Hero5 Black to do what you want it to. For example, saying "GoPro Take a Picture" instead of "GoPro Take a Photo" will not get you your photo. It could do with slightly more evolved language in that regard. The Hero5 Black will capture 12-megapixel images, offer access to RAW files and it will also capture HDR-like photos, which GoPro calls WDR. Video image stabilisation is also finally on board, which works very well in our experience - especially when riding a horse on very bumpy terrain - while GPS location tagging is a nice added extra. The Hero5 Black also offers built-in stereo sound and wind noise reduction, the latter of which worked brilliantly when we were at the top of a very windy mountain and when we tested the Hero5 Black in the Karma drone. Despite tables being blown over, the wind can barely be heard in that footage. GoPro increased the audio range of the Hero5 Black by 10dB compared to the Hero3+, and the new device is also said to offer twice the dynamic range. On the whole, audio results are clear with no muffling, as has been the case with previous devices due to their housing restrictions. That's no longer the case. In terms of other extra features over its predecessors, the Hero5 Black adds a new field-of-view called Linear Mode. This mode is in addition to the SuperView, Wide, Medium and Narrow field-of-views, offering a more natural perspective by making things such as the horizon look flat rather curved. It's a great option when using the Karma drone, but it's also a nice option for those who want a more standard shot. Field-of-view options are determined by resolution. SuperView offers 4K capture at a maximum of 30fps, Wide offers 4K capture at up to 24fps, Medium and Linear offer 2.7K capture up to 60fps, while Narrow offers Full HD capture up to 80fps. The GoPro Hero5 has a slightly more capacious battery than the Hero4: it's 1,220mAh compared to 1,160mAh. Which, Hero3 and Hero4 users, probably has you wondering "can I use the same battery in the Hero5?". The answer is no, so those older spares you have you'll have to buy into again. This new battery is removable (unlike in the Session) and, as we mentioned previously, it is now charged via USB Type-C, which is much more useful than the mini USB of older GoPro devices as it means a charge in around 45-minutes. Based on our experience, we were able to capture around two hours of footage before the Hero5 Black died on us. This was dependent on how much we were fiddling with the settings on the touchscreen however. Touchscreens use lots of power so pick the setting that best suits what you're trying to capture and try and stick with it. Video quality is great, as we have come to expect from GoPro. We used several settings in several scenarios and the results were all brilliant. The beauty lies in the fact that you can simply press record and have decent, shareable footage on your smartphone or computer within a few minutes. Yes, you might need to do a bit of editing with the Quik app (which is separate to the Capture app), but ultimately, the groundwork is all there and it's very good. Connecting the Hero5 Black to a smartphone is still a little fiddly, as it is with preceding GoPro models, but it was made slightly easier thanks to the connect option on the touchscreen, found by swiping down from the top. After you've linked your smartphone to the Hero5 Black's Wi-Fi, the Capture app will allow you to control the camera, as well as see the videos and images you've already captured, as has been the case in the past. The touchscreen being part of the GoPro design is a very welcome addition, which makes using the action cam far simpler than ever before. Then there's the main unit's waterproofing - without the need for the bulky housing - which brings plenty of added benefits to design, style and sound capture. Couple those positives with voice control, video image stabilisation, the ability to capture a more natural perspective, and there really is very little to complain about. It's only really the two-hour battery life that, as ever, could be better - but you can swap out the batteries if you buy additional extras (although the Hero5's battery is a different capacity, size and shape compared to older models, so you can't rely on those old spares if you have any - which could prove costly). The Hero5 is a new breed of super Hero, perfect for upgraders of newcomers alike. It modernises the series and, ultimately, reinforces GoPro's position as king of the action cams.